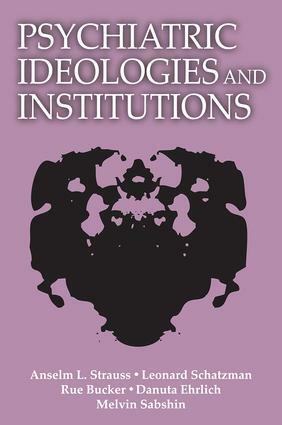 The authors of this volume point out that what is ordinarily termed the psychiatric hospital's "social structure" is principally derived from three sources: the number and kinds of professionals who work there; the treatment ideologies and professional identities of these professionals; and the relationships of the institution and its professionals to outside communities, both professional and lay. They describe hospitals as sites where ideological battles characterizing the mental health arena are being fought, implemented, critiqued, modified, and transformed. This classic monograph in medical sociology was originally published in the 1960s. The period studied was 1958 through 1963, when somatic and psychotherapeutic ideologies were flourishing—as now—and milieutherapy was just emerging. The research team was multidisciplinary: three sociologists, one psychologist, and one psychiatrist. Three distinct psychiatric environments were researched: two at the Chicago State Hospital—"chronic services" and "treatment services"—and one at a private hospital. What evolved were thoughtful comparative analyses of hospitals, wards, professionals, ideological positions, careers, and organizational and situational placements.